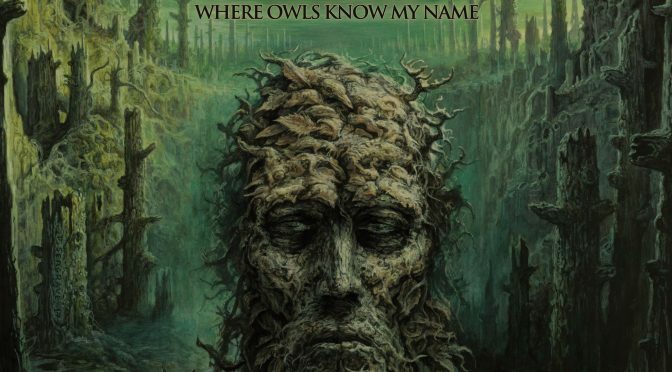 Prior to Owls, I’ve found Rivers of Nihil to be a thoroughly middle-of-the-road band. They’d written songs entrenched firmly in the idiom of modern progressive death metal, songs full of technical flare and cool structure that, to my ears, just didn’t have enough to set them apart from the dozens of other bands playing that style. It’s only by breaking the mold, by taking stylistic risks and allowing themselves to make exactly the record they wanted to make, that they’ve achieved a truly standout piece of work. Swathed in the theme of autumn and tracing a loose concept about the last human being, granted immortality so as to bear witness to the death of the earth, Where Owls Know My Name is a work of melancholy. The heaviness here draws its force not from rage, but from regret, from the bottled-up anguish of isolation, from the craving to return to the way things were even as one acknowledges that the past was never as one remembers it. These themes make the inclusion of saxophone and Hammond organ, relic’s of prog’s yesteryear, all the more poignant, and all that more vital to this album’s presentation. Songs like “The Silent Life”, album centerpiece “Subtle Change”, and the title track are emotive masterworks, the howling of a Frankenstein’s monster born of old prog and new prog, aching to be loved once more by those who are long gone. And Rivers of Nihil know how to crush it when they set out to crush it. Open-note stabs puncture blast beats on tracks like “Death Is Real” and “Old Nothing”, and the blackened middle section of “Subtle Change” caught me by surprise with a torrent of shrieks and tremolo riffs. This band hasn’t sacrificed one kilogram of their heaviness–they’re just writing songs that do it justice. Grooveable riffs and neck-snappers are the norm here. I’ve been listening to this one approximately since it came out, and it’s only grown on me, and no doubt will continue to do so for years. Given that they’ve stated that they don’t want to be pidgeonholed as “the saxophone band”, I can only hope that Rivers of Nihil will continue to give themselves the freedom to experiment, for if they do, I’m sure that more albums of this caliber are in the cards for them. This is my metal album of 2018.